I received an ARC of this book listed through a giveaway by Little, Brown on Shelf Awareness, and while I thought it was another historical novel about Cleopatra, I was pleasantly pleased to discover it was about her two sisters, Berenice (Elder), and Arisnoe (Younger). When I realized that, I especially liked the title, since it gives Cleopatra fans something to pique their interest, and Cleopatra's sisters are certainly shadows in the history we learn about Mesopotamia at that time. I wish the book had lived up to the cleverness of the title, but for me it just didn't. It was an OK read, but it wasn't very interesting. The book begins with Cleopatra and her father suddenly sailing away from Alexandria, leaving Arisnoe behind to face Berenice after she takes the city in a coup. The chapters alternate between narration by Arisnoe, and Berenice, and they both seemed the same to me. I had trouble remembering if we were hearing from Berenice, or Arisnoe. Berenice's hatred of Cleopatra seemed pretty lukewarm, and Arisnoe's uncertainty about her fate didn't feel urgent enough. These seemed to be the driving forces of these characters, but they were written in such a halfhearted manner that I'm not sure if they actually were or not. 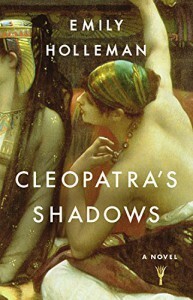 That being said, I know there are plenty of die-hard Cleopatra fans out there, and I think this book would be a good choice for them, despite the fact that it is not really about Cleopatra at all. Berenice, who hates Cleopatra, and Arisnoe who worships her, offer two points of view of the infamous queen whose reign almost wiped both of them off the map of history. I wish the author had written the characters a little better, and found a way to make the endless minutia of day to day life in the court of Alexandria a little more interesting, but I would probably still tell those Cleopatra/Egypt fans to take note of this book. Someone who knows more about the subject can be angry or joyful about the historical inaccuracies (or lack of them).